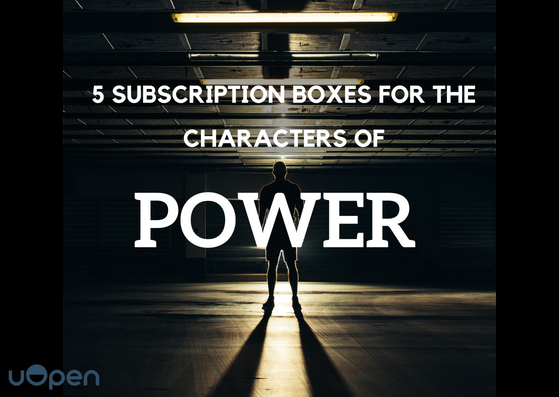 So whether your binge-watching sessions have only just begun, or you’ve been a true fan since the very start, here at uOpen we want to celebrate your favourite Power characters in the best way we know how - with fantastic subscription boxes! We’ve rounded up an ace list of subscription boxes that we believe would best suit your favourite Power characters. 1. My Dappa Box for…. Mr James ‘Ghost’ St. Patrick! What happens when you take a high-level drug dealer and disguise him as a legitimate nightclub owner? You get the ultimate master of a double life. As a businessman, James has a certain image he needs to maintain - one that’s polished, sharp, slick and always looking his absolute best. Masking his life of crime takes much attention to detail especially when it comes to how he presents himself. For this reason, My Dappa Box is the perfect subscription box for James. With a stylish selection of luxurious fashion, grooming and skincare products for men, My Dappa Box is the best way to stay groomed and fresh every month. From funky socks and stylish watches to luxurious face scrubs and soaps, My Dappa Box would keep James feeling and looking at the top of his game. The one and only Tommy Egan! He’s fiery, passionate, always up for a challenge and afraid of nothing. Tommy is the true definition of a hustler and a genuine “ride or die” friend to Ghost. He adds the ‘spice’ to the series - whether he’s causing chaos or making all the right moves, he gives viewers the edge, entertainment and comic relief they need. The Flaming Licks subscription box is full of hot sauces, spicy snacks and flaming good treats - the type of box that we know a passionate and fearless character like Tommy would devour. It takes a certain type of palate to be able to handle the flavourful heat and spices of a Flaming Licks box. Nothing would stop Tommy from tasting the flames - but does your palate have what it takes? The enchanting miss Angela Valdes! Serious federal prosecutor by day and hand-in-hand with criminals by night. She’s confident, beautiful, intelligent and knows just how to make Ghost weak at the knees. As the major love interest of Ghost, Project Lingerie fits perfectly with Angela’s flirty and classy style. Full of gorgeous and beautifully designed lingerie, Project Lingerie delivers confidence, comfort and convenience. From lovely nightwear pieces to stylish knickers, you’ll be feeling fabulous and looking fabulous with every delivery of a Project Lingerie subscription box. 4. Just Add Water for…. The super fierce Tasha St. Patrick! She’s endured it all - the gains, the losses, the tragedies and the heartbreaks. As James/Ghost’s wife, Tasha has seen it all and has stood by Ghost throughout his entire career - where there were good, bad and ugly times. Whether it was Ghost causing her heartbreak and betrayal or her son Tariq pushing her to the limits, Tasha has been through the wringer with her family. Despite all of this, Tasha doesn’t forget about herself and what’s best for her - she is still the ultimate diva that we’ve always known her to be. Which is why the Just Add Water subscription box is one that Tasha would not only completely enjoy, but appreciate as well. The Just Add Water box takes ‘me-time’ to the next level, with beautiful bath and body treats to indulge in pure relaxation - just what every deserving mother, like Tasha, needs. From bath salts to body scrubs, Just Add Water delivers the spa directly to you! The most powerful drug lord of all, Mr Kanan Stark! As the legend who taught both Tommy and Ghost everything they know, Kanan is someone you definitely would not want to get in the bad books with. He’s strong, powerful and relentless and for that, Boostbox would no doubt be just the subscription box for him. Kanan is ready for whatever comes his way and definitely dominates in the crime scene - simply because, his intimidatingly strong physique is one not to be messed with. Boostbox is ideal for fitness junkies or those seeking a health and fitness boost. So whether you’re after a strong physique like Kanan’s or you’re looking to make healthier lifestyle choices, Boostbox is a great place to start. This fitness subscription box takes you on the ultimate health journey and provides you with 12+ of the latest workout products and healthy boosts to complement and fuel every aspect of your fitness. Want to embrace your inner James St. Patrick or Angela Valdes? Why not browse our wide range of subscription boxes here at uOpen? Discover your power today!